I’ve never been one for giving things up for lent. As soon as I try to resist chocolate, it consumes my thoughts and I’ve failed before I’ve barely begun. But giving up plastic for lent? Yeah I could give that a go. The problem that is plastic is ever present through the incredible tv documentaries such as Blue Planet and A Plastic Whale. We really cannot go on discarding single use plastic and not give a thought to what happens to it once we’ve put it in the bin. Even the stuff that makes it to the recycling centre can often not be recycled and it turns out the plastic we thought was biodegradable merely breaks up into micro-plastics which we are now undoubtedly consuming through the food chain. The madwblog family have been trying to cut down on plastics for some time by taking the shopping bags to the supermarket, recycling effectively and reusing where we can but single use plastic permeates every part of our lives. Just think about the plastic in each room of your house. In your car. In your work place. It seems such an enormous beast to beat. But as the old saying goes – how do you eat an elephant? Reducing our reliance on single use plastic can be done in small progressive steps. Giving up one thing at a time leads to a change in habits which lasts. In the madwblog house we gave up buying sandwich bags first and invested in more reusable tubs to put our lunch items in. Next we stopped using bags to put fruit and veg in at the shops. Now we take canvas or string bags to carry the apples and oranges. We’re trying to remember to take a reusable cup out when we think we may make a coffee stop off and once all the liquid hand soap bottles are empty, we’re switching to bars of soap instead. The Church of England have issued a program for lent to give up the plastics and it looks pretty doable. The madwblog household are going to give it a try and, unlike the battle with chocolate, if we can’t manage it all we will have managed some and we will have begun to defeat the plastic beast. And also unlike chocolate, we won’t be going back to using single use plastic once lent is over. It’s a win-win for us and the environment. Lent begins on Wednesday 14 February and Madwblog will be reporting on #plasticfreeforlent throughout the 40 days. The Great British Spring Clean is on the weekend of 2-4 March when, as last year, there will be community litter picks in Clayhanger again over the weekend. Keep an eye on madwblog on Twitter (@madwblog) and Facebook for details. Join in. Accept the challenge. Go #plasticfreeforlent. Blessed with an unscheduled day off, and wanting to make the most of the morning sunshine, hound and I walked a route which took in the litter ‘hot spots’ in Clayhanger ahead of the Great British Spring Clean events planned for the weekend. At first, it doesn’t seem so bad. Chances are, you would barely notice it passing by in your car – but once you start looking, the amount of litter in Clayhanger is alarming. There is certainly plenty to keep a team of volunteers busy at the weekend! The hedgerows along Northfields Way, Clayhanger Lane and Bridge Street are quite packed with litter. With Spring not far away and new shoots coming up, now is the time to clear the litter out. Everyone is welcome to join the litter picks at the weekend. The meeting and finishing point is the co-op carpark on Clayhanger Lane. Both events are fully supported by Walsall Council and bags and litter pickers are provided. Any time given is worthwhile. Litter is such a blight on the neighbourhood. Not only does it affect wildlife, but it makes us think and feel badly of the area we live in. Litter breeds litter. If an area is already litter strewn, a careless passerby will think nothing of adding to it because it already looks bad. In fact, I took a photograph of litter which had been left by the barriers on Northfields Way only to find on my way home that someone had added to it by leaving a Costa Coffee cup on the curb! There is plenty of litter to be found within a few metres of the co-op carpark, so if you are short of time or unable to walk far, everyone is able to help. Spending just 10 minutes to help fill a bag with litter makes an enormous difference. Not just to your neighbourhood, but also to you. You can go home knowing that you have made a difference. The first community volunteer litter pick in Clayhanger took place on Saturday 19th March 2016 and there have been three more since. Madwblog reflects on year of rubbish. I like to think that madwblog listens to the Clayhanger Community. That’s certainly the way I intend it to work. The first community litter pick was organised in Clayhanger as a result of a conversation on Clayhanger Community Facebook page and the quarterly litter picks in Clayhanger began. That first volunteer litter pick back in March, open to all, was supported by Walsall Council and Clean and Green who provided litter pickers and bin bags. Three litter picks have followed – Summer, Autumn and most recently Christmas – and each has been whole-heartedly supported by Laura Terry from Area Partnership and Cllr Steve Wade. The litter picks have covered from the railway bridge on Clayhanger Lane, Northfields Way, into the Community Woodland, down Clayhanger Lane, the Co-op carpark and along Bridge Street to The Spot. Each event has been attended by between 5 and 10 volunteers who generously give their time for two hours one Saturday morning every 3 months. On average, that’s 56 hours of total litter collection over one year. And it doesn’t go unnoticed. Almost every time a litter pick takes place, someone pulls up in a car to say ‘Well done – what a great job you are doing!’ A great reason to feel warm and fuzzy and a little bit smug. And it’s easy! No prior experience or special skill needed to pick litter (although I do admit to wrangling with a picker tangled in a hedge whilst trying to extract an elusive drinks can – but I expect that’s just me). The problem is, the litter doesn’t stay away. Within no time at all its back and sometimes it seems worse than ever, especially in the winter when its gets blown around and the bare hedges don’t hide it. I know there are several folk in Clayhanger who frequently go out with a bin bag and collect litter whilst walking the dog and many of you will know long-time Clayhanger resident, Malcolm, who not only diligently collects litter, but also empties over-following bins on the common and even clears up dog mess. An unsung community hero. Tough and uncomfortable words. The report is well evidenced with research and well written with info-graphics, making it an easy to digest, interesting read. The final page ends with the tag line ‘love where you live and get involved’ urging us all to take responsibility for the consumption and disposal of packaging. Having established a habit for scheduling litter picks in Clayhanger, they will continue at least quarterly through 2017. The first of which will take place on Saturday 21st January 2017. The aim of this litter pick is to concentrate on the hedgerow along Bridge Street from The Spot to Clayhanger Bridge and then underneath Clayhanger Bridge. Resolve this New Year to give some love to Clayhanger Village by joining a litter pick. It’s free, (you don’t have to sign up with an email address, remember a password or even give your name) it makes you feel good and it has a positive impact on the Village and the nature we share it with. Just turn up and get picking. Clayhanger New Year litter pick. Saturday January 21st 2017. 8.30 – 10.30. Meet at The Spot on Bridge Street, Clayhanger. anti-social behaviour on the Northfields Way in Clayhanger. In recent years residents of the estate had grown increasingly frustrated by noisy and speeding vehicles, illegal parkers, fly tippers and the general anti social behaviour on this small stretch of road. Despite additional support from the area partnership and residents carefully logging incidents to build a case for more policing in the area, the problems still persisted. Earlier this year the Area Partnership and Police met with the community to discuss a proposal put forward by the council’s transport team which would see the blocking of Northfields Way at the junction with Allerdale Road as a solution to stop persistent ASB offenders gaining access to the estate. It was seen as the best solution and was supported across all political parties. All stitched up – Walsall Silver Thread Tapestry progresses. The Silver Thread Tapestry project is one which I have followed with awe. Tapestry is most definitely avant garde at present with Grayson Perry touring his tapestry most recently in my home town of Coventry. This Saturday 20th August brings one of the first opportunities to see all the elements of the tapestry together. There are 11 parts to the whole in total and Clayhanger had an input into the design of one of the panels! We will involve an army of local people to create 11 unique tapestries representing the six towns and other areas in Walsall Borough. The tapestries will reflect the borough’s living history, diversity and commonality; acknowledge the past, reflect the present and embrace the future. Creating the tapestries will provide the common thread to produce a commemorative book featuring 25 of Walsall Council’s Creative Development Team projects, which include The Brownhills Miner, Festivals and a host of other projects from the 25 year history of the team’s work. The book will tell the story of the engaging creative processes and the impact participatory arts have made in Walsall’s communities across an area so diverse in history, heritage and geography. The Silver Thread Tapestries and the book project will demonstrate how the Creative Development Team is a thread linking people, places and policies and instigating positive change in communities. We wish to celebrate and bring to life that thread and show people how we have sewn it. The link will be made with the Leather industry by including leather work on the tapestries and we have discovered that Bloxwich was famous for a while for needle making as well as nails and awl blades. Local Company Somerfields (Operational in Sandbank from 1700’s til 1992) made it into the Guinness book of records for the world’s largest needle more than 6ft long for sewing mattresses made by Mr George Davies, master forger. Midlands Artist Hunt Emerson famous for being an artist on the Beano comic, will create the designs for the 11 tapestries, at which point we will need an army of sewing groups and individuals to help sew the images. The sewing will start after Easter and continue until the autumn to create a unique set of tapestries to be exhibited together and toured around the borough in January 2017. Over the past 25 years Walsall Council Creative Development Team (Formerly known as Walsall Council Community Arts Team) delivered hundreds of participatory arts projects involving thousands of local people. We will feature 25 of the best project examples in the Silver Thread Book. Silver Thread project will be the final project of The Creative Development Team. The Launch event will also be a farewell celebration for the Staff so we will look forward to seeing people who have worked with us over the years to celebrate our achievements. Look out for further press about the Silver Thread tapestries and book as the project unfolds over the year, we want to involve as many local people as we can. The final piece will be on display on Friday 20th January 6pm – 8pm at The New Art Gallery. The level of skill involved in this piece is phenomenal. And all done by Walsall sewers. Worth a look I’d say! The internet is a truly powerful thing. 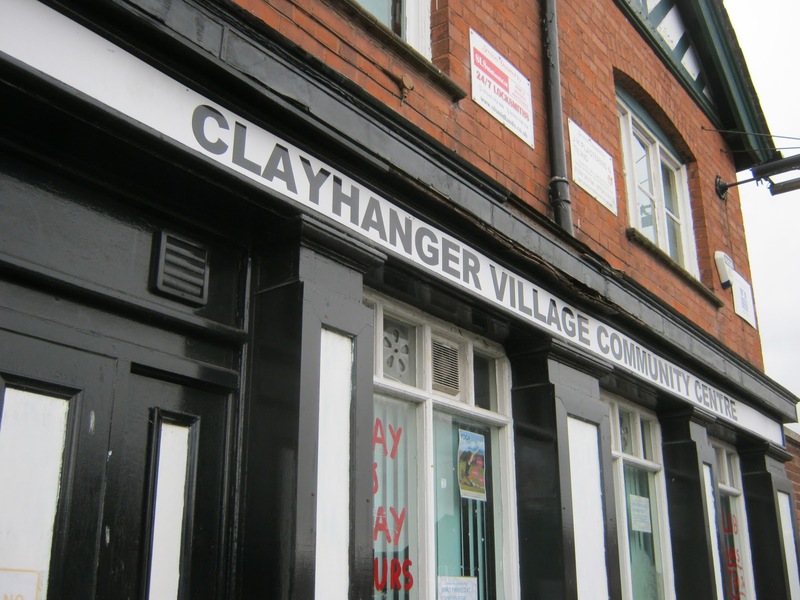 At 7.45pm on Thursday 14th July, a public meeting was called at Clayhanger Community Centre to discuss and shape it’s future. At 9.30pm on the same evening, the meeting ended and offers of administration and leafleting were made to the team of directors. By lunch time Saturday 16th July, further offers of help had come in and the list of volunteers is growing. At around 11 am Sunday 17th July, a Facebook post was made by a friend of CCC asking local tradesmen for help with a DIY SOS style intervention. By 11 pm on Sunday 17th July, scores of tradesmen had put their names and skills to a list making a commitment to address the building work issues. This evening, less than 96 hours (yep that’s 4 days before you start to calculate it) the directors of CCC are meeting tradesmen to formulate a plan to make good the areas which need repair and to make improvements so the building can be fully utilised. Now that’s not just the power of the Internet, that’s the power of people who come together for a common cause for the greater good. And that, dear reader, is magic.